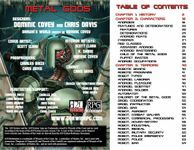 Metal Gods is a sourcebook dedicated to incorporating robots, androids, and other forms of artificially intelligent life into campaigns on the Twisted Earth. So, what will you find in this tome of Post Apocalyptic goodness? Metal Gods looks at the evolution of robotics in the alternate history of Darwin's World. A flavorful system for creating android and cyborg characters that utilizes similar mechanics as mutations and defects. Two new classes for android characters and a new class for worshipers of the Metal Gods. A collection of robotic terrors ready for use in your post apocalyptic campaigns, including androids, automatons, cyborgs, droids, and robots.